Resort Travel & Xchange (RTX), a premier vacation exchange company, selected Brother Wolf Animal Rescue as its first nonprofit organization to work with for the newly announced Charitable Giving Plan’s quarter one charity of choice for its Asheville office. As part of RTX’s prioritized Charitable Giving Plan, employees nominated local nonprofit Brother Wolf to support by raising money and volunteering their time to engage with the cause. Resort Travel & Xchange donated funds raised by a raffle, along with collecting a carload of items the shelter needed, including food, medicine, and other pet supplies. Brother Wolf Animal Rescue is a No-Kill organization whose mission is to help build No Kill communities. They are about to break ground on their 83 acre sanctuary property to help promote a better understanding of, and respect for, all animals. The organization’s vision is to lead by example in a community that embraces its core ethic of uncompromised compassion. 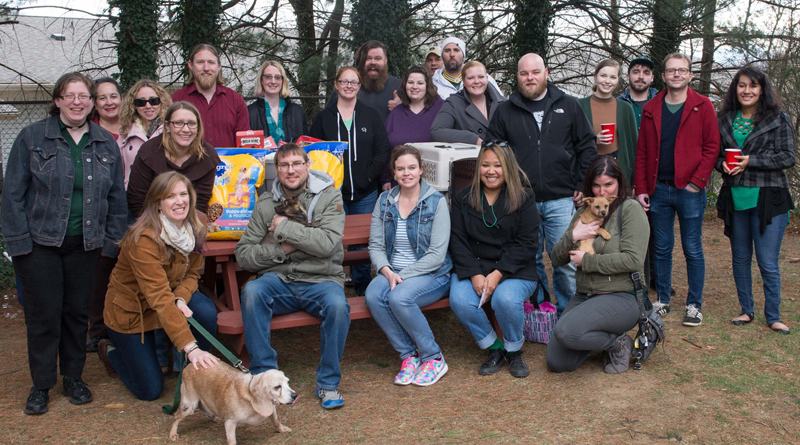 On St. Patrick’s Day, the RTX office hosted two puppies and a senior dog from the shelter during the holiday party. The “Puppy Gram” from Brother Wolf prompted an enthusiastic response from employees. With an elevated desire to continue working with the shelter’s dogs, 15 employees volunteered for a several-mile-long hike across the mountains of Asheville to exercise and socialize some of the dogs who were awaiting adoption. In addition to RTX’s work with the local shelter near the Asheville area, the Orlando center chose to host an office food drive. The office of 20 employees collected more than 100 pounds of dry goods that will be donated to a local major provider, the Catholic Charities of Central Florida. Lauren Tokles, a representative of the Orlando office, proposed the slogan “One Can Make a Difference”. The region started the year 2016 off with a poverty rate of 16.2 percent, well above the national average of 15.6 percent. As part of the Orlando community, representatives identified the problem and wanted to help make a difference. The RTX Orlando office has embraced Lauren’s motto and will continue to accumulate items until the donations are presented to Catholic Charities at the end of April. RTX will continue to actively engage its community each quarter with new local charities and creative ideas to give back. To learn more about RTX’s commitment to community, read about its Charitable Giving Plan for 2017 here. Brother Wolf Animal Rescue, located in Asheville, NC, was founded in 2007 to provide the resources and life-saving programs to help build No Kill communities. As a grassroots organization, BWAR operates a one-of-a-kind adoption center in Asheville that is open to the public 365 days a year, making it easy to adopt, volunteer, and become involved in their No-Kill mission. Their No Kill Community Development Initiative is currently working with 5 chapter communities to help teach them how to implement life saving programs and to build their own No Kill communities. 2017 marks their 10 year anniversary! The Brother Wolf Animal Sanctuary, set to break ground in 2017, will be a place for both animals and humans to come to heal, as well as an educational hub on how to live a more compassionate lifestyle. Catholic Charities of Central Florida is the largest non-profit social service organization in Central Florida and has been providing hope and building opportunity in the Central Florida area since 1962. Our mission is to provide vital social services to people in need regardless of their religious, social, or economic background, to improve lives of individuals, families and the community. These services include: Preventing Homelessness, Alleviating Hunger, Providing Access to Healthcare, and Caring for Immigrants and Refugees.